Concerted Efforts Lead to Fuel and Pollution Savings for Retailer Haulage Fleet. UK – Trailer manufacturer Gray & Adams has won plaudits from major customer Waitrose in assisting the retailer in its search for ever more environmentally friendly solutions with regard to its road haulage fleet. Between the two, together with recommendations from a Cambridge University team, they have evolved a breed of ‘Ultra-low carbon’ semi-trailers and the aptly named Simon Gray, Vehicle Engineering Manager for Waitrose parent the John Lewis Partnership (JLP), highlighted the manufacturer’s ability to turn radical designs into practical reality saying: “We’ve worked with Gray & Adams for many years and the collaboration between our two companies’ works well. It’s all very well having a nice set of drawings, but you then have to make it work in the real world. Gray & Adams did a good job of that. We sat down with the manufacturer and worked our way through it. The John Lewis Partnership (JLP) is a member of the Centre for Sustainable Road Freight (SRF) consortium. A collaboration between Cambridge and Heriot-Watt Universities and organisations in the freight and logistics sectors, this researches engineering and organisational solutions that seek to make road freight economically, socially and environmentally sustainable. 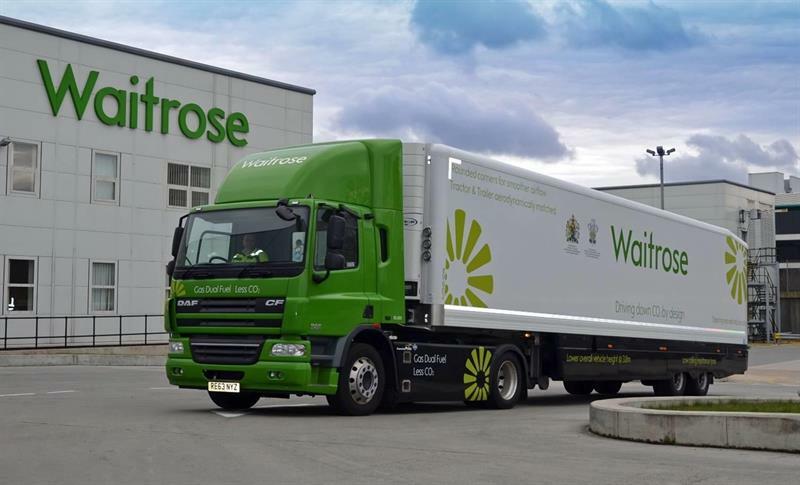 Underlining its commitment to fuel-efficiency and carbon reduction, Waitrose has long specified its Gray & Adams trailers with wind-cheating features such as large radius panel cappings and side skirts. However, through the JLP’s participation in the Government’s Low-Carbon Truck Trial programme, and with regular input from Cambridge University, the retailer has developed a ground-breaking trailer that takes environmental compatibility to another level. A tapered ‘boat tail’ on the upper rear of the trailer Slightly tapered sidewalls at the rear. A lowered overall vehicle height. A smooth underside, open at the back, to help air flow out from beneath. An air management kit for the tractor, matched closely to the trailer with minimal gaps. The results of simulation modelling and other tests were encouraging, but practical considerations would be key to the success of the project – crucially, to be economically viable the ‘boat tail’ design must entail no loss of cargo space, while the new trailer must also be compatible with Waitrose’s loading bays and existing equipment.